Sorry for the long delay between mixes! Life has been busy and complicated lately and time has a way of slipping by. I also thought I’d breeze through putting this mix together but I ended up tweaking it for weeks to try and get all the sound levels right. I also will try my best to not let too much time go by before my next mix. I have two mixes (unrelated to this current mix) that I have collected most of the tracks for, so I will be starting those soon. Thanks so much for all your kind words and concern. They mean everything to me. I would like to present: Music for Stargazing Vol 1. The idea for this mix was generated several years ago actually. My friend Dave (from Low Light Mixes) and I take an annual trip to a lake cottage in northern Wisconsin. It’s far out in the country, away from the wash of city lights. At night, the sky is filled with an amazing blanket of stars. At this lake cottage we got in the habit of sitting out at night to look at stars and enjoy a cold brew. Besides stars we could also often see satellites track across the sky and any number of shooting stars. Years ago I decided to put together a CD mix made specifically for sitting out and looking at stars. I went for tracks that, in my mind, gave the listener a very slow, drifting, expansive and somewhat awe-inspiring feel. Some of the artists that were the biggest inspirations for this mix include Steve Roach, Brian Eno and Jeff Pearce. This is a more straightforward mix than some of my others and utilizes fewer, longer tracks. Over the years I have collected dozens of tracks I used for various stargazing mixes. The tracks used in this mix are from my old collection of stargazing cuts. I did a newer mix of cuts last year in The Stars My Destination mix. I did reuse a couple tracks from that mix because they were from the original collection. 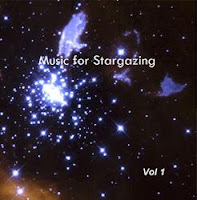 So, here is the first of what may be a series of Music for Stargazing mixes for the Hydrogen Cafe. Go grab a beer, pop this mix onto your MP3 player or burn it to a CD and slap it onto a boombox, head out into the night, and enjoy the magic of stars. This mix would work well as a sleep mix too. I hope you enjoy it.